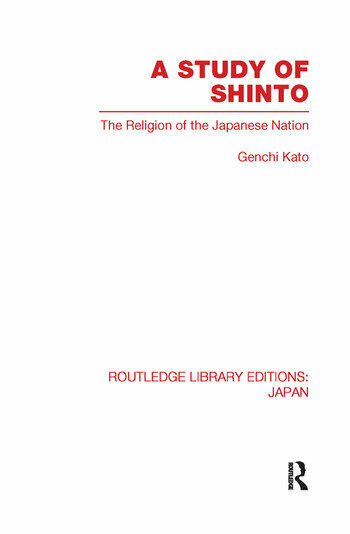 This volume investigates and presents the salient features of Shinto through a long history of development from its remote past up to the present. It is a historical study of Shinto from a scientific point of view, illustrating the higher aspects of the religion, compiled on strict lines of religious comparison. Introduction. Genetical or Historical. 1. Some Traces of Animatism or Pre-Animism in Shintō 2. Animistic Phases of Nature Worship Among the Japanese – Complex Nature Worship 3. Fetishism and Phallicism 4. Spiritism 5. Anthropolatry and Ancestor Worship in the Stage of Nature Religion 6. Totemism and Primitive Monotheism in Original Shintō 7. Shintō as a Sheer Polytheism 8. Theanthropic Aspect of Shintō Deities – Shintō as a Theanthropic or Homocentric Religion 9. Shintō is the Japanese National Religion or Natural Growth 10. Ancient Shintō Practices 11. Dawn of Intellectual Awkening 12. Dethronement of Minor Deities and Amalgamation or Unification of Different Deities 13. From Polytheism to Pantheism with Some Phases of Henotheism and Montheism 14. Ancient Myths and the Three Divine Imperial Regalia: An Attempt at Rational Interpretation 15. Germs of Moral Ideas in Shintō and Appearance of a Change in the Idea of Sacrifice 16. Inner Purity Emphasized, and Sincerity or Uperightness as the Fundamental Ethical Principle Becomes Pre-Eminent in Shintō 17. Ethical Transformation of the Naturalistic Phallic Deities From a Higher Religious Point of View and Some Shintō Rites or Ceremonies Moralized 18. Worship of Shintō Deities in Spirit and In Truth – Resulting in Iconoclasm 19. Some Deeper Reflections Upon the Divine Protection of the nation – A Problem Unsolved From the Old Standpoint of Shintō, the National Religion of Japan 20. Unique Position of Shintō Among the World’s Religions. Bibliography. Index.